Dixie Pacific® manufactures fiberglass pergola kits using pultrusion technology to produce the strongest yet lightest structures available with a Limited Lifetime Warranty. Structural fiberglass components are strong, lightweight and provide a higher level of aesthetic quality than vinyl or wood pergolas. Available in 3 overhead sizes: 12×12’, 14×14’ and 16×16’ with a choice of square or round no-taper DuraLite® columns. 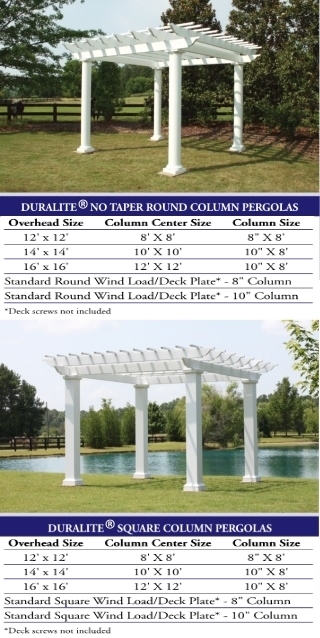 For custom pergola sizes, please call us at 800-966-9261 or e-mail your layout to info@deckbuilderoutlet.com. STABILITY - Fiberglass beams can span longer distances that wood or vinyl. Unlike wood, their high strength-to-weight ratio keeps them from sagging under their own weight. Unlike vinyl, they are unaffected by variations in temperature and will not sag in hot climates. Our stock pergolas are wind load rated. HIGH STRENGTH-TO-WEIGHT RATIO - Pound for pound, our light weight fiberglass-reinforced components are stronger than steel, This allows for quick and easy installation without the need for cranes or large crews. CORROSION RESISTANCE - Fiberglass-reinforced composites are naturally corrosion resistant. They will not rust, corrode or pit in external applications. CONSISTENCY IN APPEARANCE AND PERFORMANCE - Compared to traditional materials, fiberglass components offer a uniform appearance that lasts for years. They do not twist, warp or bow after installation and they maintain their full strength over the life of the product. EASE OF INSTALLATION - Our pergolas are fabricated to specific dimensions, making installation easy and fast. 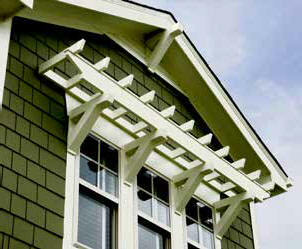 Parts are clearly marked and all hardware is included so that your pergola can be completed in hours. LOWER “LIFE CYCLE” COST THAN TRADITIONAL MATERIALS - Over the life of the pergola, the durability and weather resistance of fiberglass components make our products a great investment. They are virtually maintenance free and will provide many years of enjoyment.